One of the most common concerns for people considering the value of pulsed electromagnetic field (PEMF) therapy is its association with the negative effects of other man-made environmental magnetic fields (EMF) in the environment and the so-called “electro-smog” they create. Before we discuss all the beneficial effects of therapeutic PEMF devices, I first want to address this common reservation. There are many differences between harmful EMFs and the therapeutic EMFs generated by PEMF devices. Magnetic frequencies and waveforms will either amplify or diminish the body’s own signals. Harmful EMFs negatively affect the body’s natural functions while therapeutic EMFs act in supportive ways, enhancing cellular communication and overall health. The balance or “homeostasis” of the human organism can easily be negatively affected by electromagnetic changes in the environment, and an unbalanced body is more susceptible to disease. EMFs interact with living systems, affecting enzymes related to cell division and multiplication, growth regulation, and regulation of the sleep hormone melatonin (controlled by the pineal gland metabolism), among many other effects. The primary differences between harmful and therapeutic EMFs are exposure time, wavelength, and frequency. Confusion often stems from our electric power grids using 50-60 Hz frequencies, which fall within the same frequency range as many therapeutic PEMFs. There are a few important differences to keep in mind when comparing these EMF sources. By far, the strongest man-made magnetic fields are emitted from high voltage transmission lines (which are the big metal towers, not the single wires that tend to run through neighborhoods on wooden poles). It is generally accepted that a “safe distance” from large power lines is about 700 feet (or 0.1 mile), and a “safe distance” from the neighborhood lines is as little as ten feet. The intended 50-60 Hz frequency of power lines is becoming increasingly contaminated with surges of radio frequency EMF radiation, often referred to as “dirty electricity.” Modern electrical devices tend to induce high levels of these surges or spikes back into the electrical system. Therefore, our power grids are contaminated with frequencies much higher than the intended 50-60 Hz and it is likely that these high-frequency, short-wavelength surges are the cause for some concern. Cumulative exposure—hour after hour, day after day—to EMFs is of the greatest concern. Ordinary household appliances tend to generate larger cumulative EMF exposures than power lines, as most people do not live close enough to power lines to be dramatically affected by them. The same cannot be said of kitchen appliances, computers, televisions, cell phones, and even electric outlets (especially if it’s directly behind the headboard of a bed). Though EMFs from appliances drop off to negligible levels at a distance of about sixteen feet, people are generally much nearer than that to the source of the electromagnetic field—typically eighteen inches from computers, a few feet from televisions, and practically no distance from cell phones. External EMFs above the range of 50-Hz and EMF intensities encountered in homes of >1-100 mG, with daily magnetic-field exposure, may be associated with poorer health and more “chronic anxiety” symptoms. This is consistent with a direct effect of continuous long-term 50-Hz magnetic field exposure on the nervous system. Strategies to reduce this environmental exposure need to be considered to be able to achieve the best clinical results. These mitigation strategies are beyond the scope of this blog. Information on electromagnetic field mitigation strategies is available at Dr. Magda Havas’ website and many other sources. The question of EMFs, whether from power lines or microwaves, causing cancer was reviewed by the US federal government via the National Institute of Health’s National Cancer Institute. There appears to be an increased risk of childhood leukemia but only for those children exposed to at least 0.3 µT on a daily basis. This amount of exposure only happens in about 0.5% of children studied. Studies of childhood exposure to electrical appliances, Wi-Fi, and cell phone base stations show no significant risk. Studies examining preconception or pregnancy exposure risk for cancer in future children have been inconsistent and need further evaluation. In children with leukemia EMF exposure was not associated with poor survival or risk of relapse. For adults, workplace exposure does not increase the risk of leukemia, brain tumors, or female breast cancer. This also applies to work place exposures to radiofrequency/microwave radiation. Whether residential exposure increases the risk of breast cancer is still an open question, requiring additional research. The types of EMFs of possible concern present in these findings have significantly shorter wavelengths and higher frequencies than therapeutic PEMFs. The electromagnetic spectrum is vast, encompassing all possible wavelengths and frequencies, including X-rays, microwaves, radio waves, visible light, and infrared. Practically speaking, for therapeutic PEMF magnetic field applications, the electromagnetic spectrum is very narrow, mostly in the extremely low-frequency (ELF) range. The goal of a PEMF system is to produce a magnetic field that will not only be supportive to the body’s natural functions, but also to use wavelengths that will go all the way through the body. This requires long wavelengths and low frequencies. A PEMF frequency of 1 Hz has a wavelength of 100 million meters (more than 62,000 miles). At the upper range of what would be produced by an ELF PEMF treatment system, the frequency can be about 10,000 Hz or so. The wavelength there would be 10,000 meters (about 6.2 miles). For comparison, a low-end microwave-range frequency would be about 100,000,000 Hz. This would correspond to a wavelength of about 1 meter (0.00062 miles). So, ELF PEMF systems have long electromagnetic wavelengths that go completely through the body, including all the PEMF systems I’ve tested and recommend. The microwave part of the electromagnetic spectrum has wavelengths ranging from about 30 centimeters (12 inches) to 1 millimeter (0.04 inches); with frequencies between 300 MHz (100 cm) and 300 GHz (0.1 cm). The above broad frequency range includes both UHF and EHF (millimeter wave) bands. Microwaves have frequencies ranging from about 1 billion cycles per second, or 1 gigahertz (GHz), up to about 300 GHz. Here are some examples of common high frequency sources: radar – from 1,300 to 1,600 MHz; most microwave applications fall in the range 3,000 to 30,000 MHz (3-30 GHz); microwave ovens – 2.4 GHz; amateur and radio navigation uses 3-30 GHz. VHF television Channels 2-4 – 54 to 72 MHz; VHF TV channels 5 and 6 are between 76-88 MHz; FM radio and VHF television Channels 6 and 7 are from 88-108 MHz; cell phone frequencies from 824-1990 MHz; WiFi from 900 MHz to 60 GHz bands. All these microwave frequencies are a relatively constant part of the artificial environmental magnetic field [EMF] exposure that humans have. The risks to humans of these kinds of relatively continuous exposures are still being determined. Microwaves interact with matter to produce molecular rotation and torsion. Because of the shortness of the microwave wavelengths they tend to penetrate relatively superficially into the body and are absorbed, creating various levels of heating. Obviously, heating is one of the major uses of microwave ovens in our homes. Electromagnetic radiation is further classified into two types (ionizing and non-ionizing) based on the radiation’s capability of ionizing atoms and disrupting chemical bonds. Ultraviolet and high frequencies, like x-rays or gamma rays, are ionizing. They pose their own health hazards, the most common of which is sunburn. They may also include the induction of cell transformation, producing cancers, such as the skin cancers squamous cell carcinoma and melanoma. Non-ionizing radiation (such as ELF PEMFs) doesn’t carry enough energy to disrupt chemical bonds. It only has enough energy to excite electrons into a higher energy state, increasing charge in the tissues, through the process of inductively coupled electrical stimulation (ICES). Almost all therapeutic ELF PEMF systems are non-ionizing and use the principle of ICES. Most therapeutic PEMF systems produce frequencies in the Extremely Low Frequency (ELF) to Very Low Frequency (VLF) range of the electromagnetic spectrum. These frequencies (below 10,000 Hz or 10 kHz) do not induce damaging heating actions in cells or tissues. PEMF devices also contain various levels of filtering inside the control unit or frequency generator portion of the system, which clean up the surges/spikes, mentioned above, that often come out of the household outlets we use to power the device itself. How PEMFs can help protect against harmful EMFs? As mentioned above discussion of mitigation strategies is also a large topic and beyond the scope of this blog. Information on electromagnetic field mitigation strategies is available at Dr. Magda Havas’ website and many other sources. The best protection is avoidance. Since total avoidance is not completely practically feasible, people have suggested other strategies. One commonly recommended strategy is to use devices that broadcast, actively or passively, neutralizing frequencies. Passive radiant frequencies from pendants, crystals, color or other materials have been found to provide a small measure of benefit. They are not likely to be that beneficial in the face of strong EMF sources, such as cell phones or cell towers, because they may not reliably provide a counter-active benefit. Another option has been to use a more active radiant source of frequencies with PEMF signals. One such example is the Harmony USB device. This little device is plugged into a USB port and emits the average Schumann resonance of 7.8Hz, modulated with a frequency of 1.2Hz. The field intensity of the HarmonyUSB is around 10 microtesla (0.1 gauss). Treatment time is continuous as long as the USB is plugged into a powered device. Since people sit around their computers and laptops for hours a day, having this harmonizing low intensity signal is expected to help and to dampen the stress responses of the body to the EMFs emitted by the computer and surrounding EMFs as well, to some extent. A major approach to protecting oneself from EMFs is using therapeutic or health maintenance PEMFs. When whole body PEMFs are used, whether for treating specific problems or general health maintenance, all the cells of the body in the area of the magnetic field are tuned, balanced and energized. Since PEMFs have stress reduction functions and stimulate cells to optimize their health, EMFs are less likely to meaningfully or significantly disrupt cellular function. Research has shown that healthy cells largely ignore EMF and PEMF signals. This doesn’t mean the signals don’t create a reaction from cells, but healthy cells have a minimal response to these surrounding signals and rebalance themselves through the process of homeostasis almost immediately. A study done at the University of Virginia found that when blood vessels in healthy individuals were exposed to a PEMF signal they had a very small and rapid dilation response in 1000th of a second and just as rapidly rebounded by constricting slightly and then equally quickly went back to normal. The University of Virginia research also indicates that treatment times will need to be longer than the often touted eight minutes a day, because blood vessels rebalance very rapidly, even if one only considers improvements in circulation. However, all the other benefits of PEMFs, including ATP production to increase the energy of cells, can also take longer periods of exposure to see significantly better benefits. 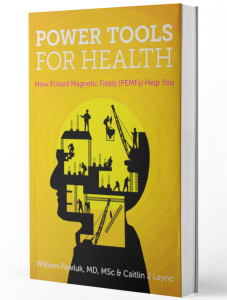 To learn more about the vast range of benefits PEMFs provide the body, read my book ‘Power Tools for Health’. The goal with daily whole body PEMF stimulation is to maintain the optimal health of cells. These cells then become resistant to the negative effects of EMFs. Trying to do PEMF therapy occasionally cannot take into account daily EMF exposures of which a person is not even aware. Chronic exposure to EMFs leads to cumulative, subtle and progressive effects on the cells of the body. Scientists suspect that the degree of aging we see in people today has a lot to do with the cumulative burden of EMF exposure. This is why I’m a strong proponent of daily whole body PEMF treatment. There are a range of whole body PEMF systems available on the market today, ranging in price and magnetic field intensity. Because intensity and ease-of-use matter, one of my favorites is the BioBalance. The BioBalance was developed to offset the disadvantages and costs of many of the currently available PEMF systems, and can be used not only for health maintenance but also for treatment. Therapeutic ELF PEMFs pose almost no harm to the body as has been shown with use over five decades and by millions of people. Most of these ELF PEMFs tend to be in frequency ranges to which the body is more naturally exposed, either from within or without. Other external or environmental EMFs tend to be of significantly higher frequencies, typically unknown in nature to the degree to which humans are currently being exposed. These exposures are almost continuous and, most importantly, are absorbed by the body creating unpredictable and possibly unacceptable changes to tissues. Therapeutic ELF PEMFs, because of their much longer wavelengths, pass completely through the body, energizing cells, helping to re-balance and restore body functions and health. Daily use of whole body healthy PEMFs can help significantly to offset the negative effects of undesirable environmental magnetic fields.